Today, Friday February 12th 2016, is the 207th anniversary of Charles Darwin’s birth. Celebrated around the world as ‘Darwin Day’, events across 6 continents from Tel-Aviv to Tokyo will commemorate the English naturalist’s work, explore his legacy, and discuss the current state of affairs in the field of Evolutionary Biology and beyond. Whilst the majority of those attending lectures or participating in events today may do so to simply learn more about Darwin’s work, it is an opportune time to consider more deeply ‘why Darwin?’ Why not Newton, Einstein or Turing Day? Further, are we naïve to presume that such commemorative days are purely about celebrating history and science? Is what on the surface seems like a secular celebration of a historical scientific figure, in danger of alienating those with religious beliefs, and deifying one figure above all others? The celebration of Darwin’s legacy has a history almost as old as the man himself. In 1909, Darwin’s 100th birthday (Darwin had passed away in 1882) and 50 years since the publication of On the Origin of Species, events took place in New York, New Zealand and most notably Cambridge, where over 400 scientists and dignitaries from 167 different countries gathered. By 1909 Darwin’s scientific legacy was still unclear, as his theory of natural selection was not yet widely accepted as the mechanism for evolution. As well as the familiar activities associated with such an academic event, speeches, lectures, and the bestowing of honorary degrees, there was also an exhibition of Darwin memorabilia and his old rooms at Christ’s College were opened to visitors. For more on the 1909 celebrations see John van Wyhe’s overview at Darwin Online. Fast forward 50 years to 1959, the sesquicentennial of Darwin’s birth (that’s 150 years) and the centenary of Origin’s publication: much had changed within the biological sciences. Natural selection was integral to modern biology, Gregor Mendel’s work on hereditability had been rediscovered at the turn of the century, and through the work of the English statistician and biologist R.A. Fisher, Mendelian genetics were combined with Darwin’s theory of natural selection to unite the then disparate branches of biology, bringing together subjects as diverse as molecular biology (then known as cytology), ecology and palaeontology. By the early 1940s this new combined approach to biological evolution had become known as the modern synthesis, a term coined by Julian Huxley, evolutionary biologist and grandson of “Darwin’s Bulldog,” Thomas Henry Huxley. Rather than diluting the desire to celebrate Darwin as a stand-alone figure, the centenary of Darwin’s major publication presented an opportunity to frame recent developments in the field. Publicising the modern synthesis and placing it within a progressive narrative of rational advances in scientific understanding would not have been possible without the father-like figure of Charles Darwin. The 1959 anniversary saw international activities on a scale never before seen for an individual scientist, with events planned from Australia, to Brazil and the Soviet Union. In a break from the previous Darwin anniversaries, the major commemorative event in November 1959 took place at the University of Chicago. Taking place over five days, with 2,500 registered participants and a complete academic and public programme, the conference attracted a huge amount of media attention. As historian of science Vassiliki Betty Smocovitis has shown, the 1959 Chicago centennial celebration, “did not directly address the development of Darwin’s ideas or his work.” Rather, the 1959 events were largely about promoting the new unified field of evolutionary biology, ensuring that the US was seen as central in the field, and bringing subjects from beyond the traditional boundaries of scientific endeavour, such as anthropology, into the evolutionary biological project. by Tom KadenOne of the most stirring speeches during the 1959 celebrations in Chicago was Julian Huxley’s The Evolutionary Vision. In the speech Huxley presented a concise sketch of his humanist worldview; a unique combination of the religious, the secular, and the Darwinian. Evolution was seen by Huxley as a universal phenomenon which encompassed not only the subject-matter of the natural sciences, but also the mind and culture. Scientific humanism for Huxley was a direct result of this universal evolution. Huxley believed that it was “[m]an’s destiny […] to be the sole agent for the future evolution of this planet” (Huxley, 1960). This is why it was important to him that man became aware of his agency, especially since there were many serious problems to be solved, like “superscientific war”, “overpopulation”, and “Communist ideology” (Huxley, 1960). Here, humanism comes into play. It provides a link between the inner state of man and his social-political world and manages to resolve issues in both realms. To Huxley, preparing man for his evolutionary role was equivalent to a fundamental shift in values. Huxley saw the several kinds of “dominant thought organization” which shape mankind’s ethics and worldview as vehicles of evolutionary adaptation, since they connect the perspectives of individuals with their environment in a way that increases the chance of the individual’s surviving. He argued that if man’s place in the world changes, so must his thought organization. One such dominant thought organization is religion, which for Huxley was by no means doomed to disappear, but to be transformed. While historical religions have increasing problems to manage the adaptational problems that arise out of modern science, especially evolutionary theory, it must be possible to maintain some form of religion, since “[r]eligion of some sort is certainly a normal function of psychological existence. It seems to be necessary to man” (Huxley, 1960). For Huxley, a process of universal value change was already happening, and an “emergent religion” was already visible. The emergent religion had the property of bridging the “present split between [conventional] religion and science” (Huxley, 1960). Unsurprisingly, it was evolutionary humanism itself that Huxley advocated. “The emergent religion of the near future […] should be able, with our increased knowledge of mind, to define our sense of right and wrong more clearly so as to provide a better moral support; it should be able to focus the feeling of sacredness onto fitter objects, instead of worshiping supernatural rulers, so as to provide truer spiritual support, to sanctify the higher manifestations of human nature in art and love, in intellectual comprehension and aspiring adoration, and to emphasize the fuller realization of life’s possibilities as a sacred trust.” (Huxley, 1960; emphasis added). Huxley suggests that traditional religions cannot fulfill these functions as well as evolutionary humanism can, and he believed that in the near future, humanism would become a more potent successor of religion. The Chicago centennial celebrations made an important impression on the field of biological evolution, especially in relation to its public profile and the wider world beyond. The exceptional media coverage and publicity the event received, helped to generate enthusiasm for the subject and in turn influenced the growth of historical literature on Darwin’s life, today so pervasive it’s often referred to as the “Darwin Industry” (Smocovitis, 1999). Secondly, the conference had an unexpected influence on a growing group of evangelicals who saw the public coverage of a Darwinian worldview as an affront, and in response began to publish antievolution literature. Perhaps the most famous of all of this literature was Whitcomb and Morris’s The Genesis Flood published hot on the heels of the conference in 1961. Here we can see a direct effect of Huxley’s widely reported speech (see above) and other content at the conference, which explicitly connected Darwin and evolutionary theory directly to humanist and atheistic world views. Much like celebrations in 1959, the bicentennial anniversary in 2009 was to be a major event, especially in the United Kingdom where several television series were commissioned (notably David Attenborough’s ‘Charles Darwin and the Tree of Life’ and Andrew Marr’s ‘Darwin’s Dangerous Idea’) and a new commemorative two-pound coin was minted. Again the anniversary became about using Darwin to promote scientific endeavour and the continued canonisation as one of the greatest Briton’s of all time. For a list of Darwin related events from 2009 check out Darwin Online. 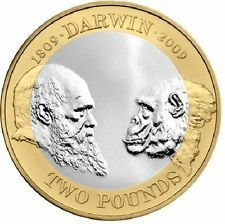 The commemorative two pound coin produced for the bicentennial of Charles Darwin’s birth in 2009. The edge inscription reads, “ON THE ORIGIN OF SPECIES 1859”. by Fern Elsdon-BakerIn 2009 the Darwin anniversary celebrations went global to an unprecedented degree, with the Darwin Industry out in full force. I was fortunate enough to spend that year running one of the largest anniversary projects worldwide, the British Councils contribution to the celebrations, Darwin Now, a project that ran over 2 years in 50 countries worldwide. As part of Darwin Now we ran a very successful conference with over 800 participants from 33 countries at the Bibliotheca Alexandrina in Egypt. This event gave many of those involved – including myself – a needed moment to pause and reflect on the geopolitical and cultural context of Darwin and the way that we in the ‘west’ celebrate him as an icon. Whilst, Darwin’s work has certainly had a profound impact on the way we think about the natural world, and rightly deserves celebrating, should we perhaps be wary of the hidden social and political agendas behind his placement on a pedestal? When working to try to communicate evolutionary science internationally in all its many and diverse forms today, we need to remember that science is a global endeavour and should rightly be inclusive to all, regardless of cultural or national background. Unfortunately, Darwin’s legacy has been tainted by its misappropriation over the years, which has a profound impact on the way that global audiences engage with his work – we need to be very wary of the hijacking of scientific research for social or political agendas. Sadly, what became evident in 2009 was that in some aspects of the celebration of the great man, there was a tendency to create an ‘us and them’ overly atheistic version of Darwin’s work and evolutionary science as a whole. This can only prove counter-productive in the longer run, and can only act to exclude many people of faith from engaging with his work and contemporary evolutionary research. And lest we forget Darwin by his own account in his autobiography was not an atheist when he published Origin of the Species nor indeed would he have identified as an atheist throughout his life. During years that don’t coincide with a major anniversary in Charles Darwin’s life, events, celebrations and histories are still regularly produced, but are often limited to days such as 12th February and are much more disparate in their co-ordination and focus. Since 2003 attempts have been made to make this somewhat organic and nebulous approach to celebrating Darwin’s legacy on 12th February, into a more formalised event through the non-profit educational corporation known as the ‘Darwin Day Celebration’. Given the history briefly outlined in this post of appropriating Darwin as a figurehead for contemporary concerns, it may come as little surprise to learn that the ‘Darwin Day Celebration’ is in fact supported by the American Humanist Association. This increasingly dominant framing of evolutionary biology and by misappropriation Darwin himself, as inherently humanist or atheistic, presents a real problem for those of us interested in education, science communication and the popularisation of evolutionary biology. With a large proportion of humanity identifying as religious in one form or another, the atheist appropriation of evolutionary biology, with Darwin as its unelected figurehead, only serves to push millions of people away from learning more about one of the most elegant and beautiful scientific theories ever proposed. Teachers, academics, journalists, television producers, authors – all of us, who are passionate about evolutionary biology and Charles Darwin’s life and work, must approach Darwin Day with some humility, and learn how to celebrate without deifying.